There are lots of great and inexpensive marketing techniques that small businesses can use. Utilize some of our favorite tips inspired by WordStream to successfully market your small or local business! Creating proper signage for your small business can greatly increase awareness in your community. Sidewalk signs, yard signs, as well as channel letters or a light box on your building will lead to greater community awareness and an increase in traffic to your business. Sidewalk signs and yard signs should be places in areas near your business high in foot traffic to attract the attention of potential customers walking by. Make your business cards stand out and stick in the memory of those you share them with. As a rule of thumb, any time you shake someone’s hand, provide them with a business card. Frequently handing out business cards is especially important for small, local businesses to increase awareness. Even if someone just gives your card a quick glance, a great business card will be remembered when they are in need of the products or services you provide! Teach a class or host a fun evening event for community members. Create flyers for your event and post them throughout the community. Many public places like libraries, coffee shops, local colleges and gyms have community bulletin boards just for the sharing of these flyers! Also share information on social media platforms for added exposure! 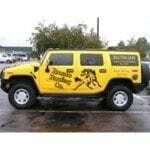 Placing magnets or decals with your company information on company vehicles is great mobile advertising! This simple advertising technique will reach other drivers each day and is especially great for businesses that involve a lot of travel. Vehicle magnets are especially helpful for small businesses, since they can be taken on and off your vehicle depending on if you are using it for work functions or home use. Local events and contests are a great way to get involved in the community, while also spreading brand awareness. Donate a product or service that your company offers as a prize at an event raffle, or sponsor a local sports team. These small things will mean a lot to the community, and provide your business with extra exposure! 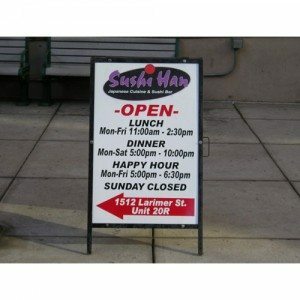 For all your small business signage needs, contact Signarama online or at 303-914-9700. We hope to hear from you soon!